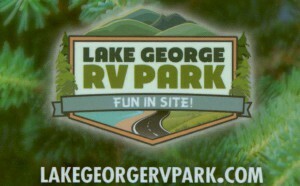 Buy Lake George RV Park Gift Cards: Great For Families Planning a Trip! What better idea for a gift than a Lake George RV Park gift card? Purchase a personal Lake George RV Park gift card good for a vacation getaway at our location in the foothills of the Adirondacks in Upstate NY. Our card is the perfect gift for anyone who is interested in visiting our RV Resort. Have family and friends who are planning a trip? Surprise them with a card to let them know you’ll be thinking of them while they are away. It also makes a wonderful treat for beginner RV enthusiasts who are new to all the fun RV camping provides. And, of course, experienced campers are always looking for a reason to get away for a weekend or a week! Simply fill out the form and a gift card will be sent to the recipient of your choice. And the best part is: Gift cards can be applied toward campsite fees or any retail and cafe purchases at Lake George RV Park. Gift cards have no expiration date. **Limit $2,000 gift card(s) purchase per family.